Defending Blue Fleece – Small Town. Small Times. Yes, I am aware that I’ve been wearing my blue fleece every day. It’s from Old Navy and it cost $15 which is all I can afford to spend on myself during this global economic crisis. Big and warm, it’s perfect for turning down the expensive heat and eating everything in sight. I should be concerned that I’m wearing it too often — especially in my small town where I see the same people every day. Wednesday night I wore it under my green down vest to Caroline’s choir practice. I thought it looked bright and festive, like I’d just breezed in from doing something really sporty. Friday afternoon I picked up my daughers at school. Moms were complaining about the cold, rubbing their skinny arms and shivering. I strolled right past them, cozy and warm with my blue fleece zipped smugly up to the top. Saturday morning at Elizabeth’s basketball game, the local MILFs were dressed-to-kill, perched on the tiny elementary school bleachers in suede boots, hip jeans, and full-on make-up. I sat behind them and kicked back…in my blue fleece. I put it on again today, ready for a day of lounging in front of the fire and reading my new book. My youngest daughter who wears nothing but tutus and sequins sneered at me. I saw her. Perhaps I should care. But I don’t. 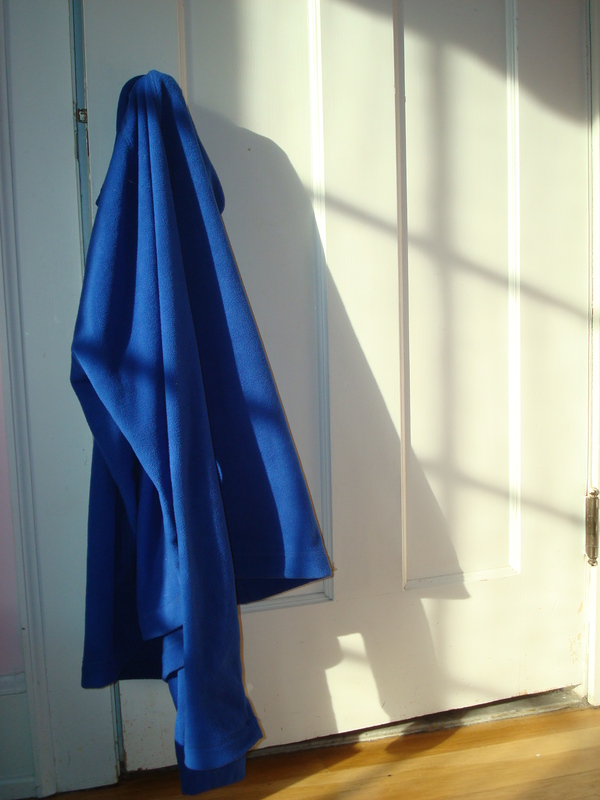 Or maybe I should care that I don’t care, but my blue fleece keeps me cozy. And right now, I need cozy. Oh yeah, I love fleece too. It must be in the genes. Cozy trumps everything. We do have cozy genes. That’s why we love soft chairs, good books and coffee + pie at 3:30 in the afternoon. Here’s to homely and warm! Yeah – you go girl-in-the-brown hoodie! I say I don’t care either, but on I did write a whole post defending it. Perhaps I care more that I want to. fleece ROCKS. And those MILFs are jealous of it. You know they are. I’ve been wearing a brown fleece myself that is perfect for Florida’s winter! If nothing else, one must always be comfortable! Had to chuckle at your daughter’s sneer — one day she’ll understand! Ahhhh, Florida’s winters. I’m so jealous! And yes, someday my daugher will understand that….but from what I see, it won’t be for a very loooonnnngggg time. Books and Friends « Small Town. Small Times.